After four years of Freedom of Information Act litigation, the ACLU has prevailed and forced the Customs and Border Patrol to release 1,000 pages' worth of training documents in which new agents learn when they can stop people and what they can do after they stop them. 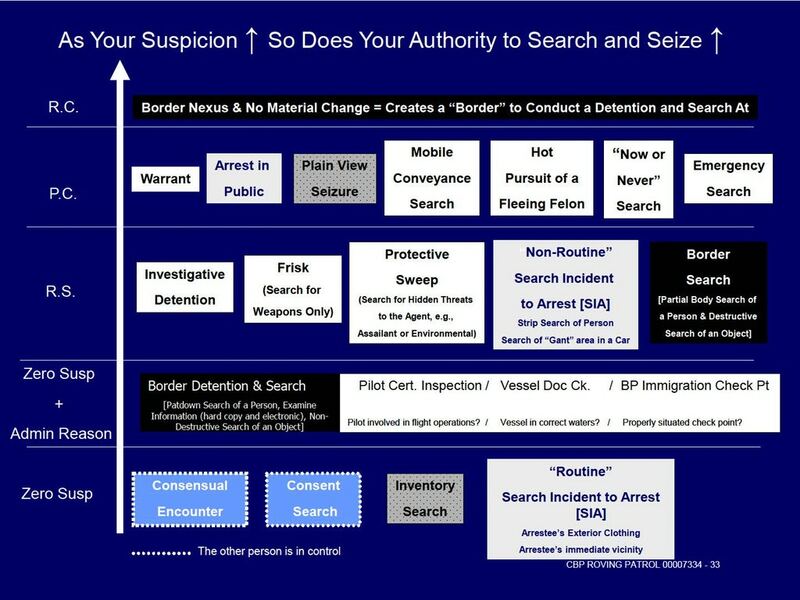 The documents are a window into the CBP's legal gamesmanship, in which the flimsiest of pretenses are spun into legal excuses to stop, search, question and detain people within 100 miles of the US border and in any city with an international airport. The documents also shed light on CBP surveillance activities, though much of this section is redacted. Of particular interest are the revelations of the CPB's shadowy "city patrol," which does not target people who've made illegal border crossings. Also interesting is the CBP's belief that it can force any civilian to operate on its behalf on penalty of a $1,000 fine (previously the CBP has used this authority to force doctors to perform medically unnecessary rectal examinations, a practice now banned by the courts). The entire chapter on electronic surveillance has been redacted in the ELC, and the unredacted sections, as well as the PowerPoint presentations, paint a complicated portrait of scenarios in which surveillance technology, when used by CBP, would constitute a search. The ELC points to Supreme Court decisions on GPS devices and thermal imagers as examples of cases in which a warrant would be required. Meanwhile, when it comes to aircraft overflights, “If the aircraft is operated lawfully and in airspace where such flights are routine, no intrusion by the aircraft into a reasonable expectation of privacy occurs,” the ELC states. According to Sarah St.Vincent, a Human Rights Watch researcher on surveillance and domestic law enforcement who reviewed the ELC, this secrecy and lack of clarity about CBP’s surveillance operations is a central feature of how the agency operates.